Recently I was lucky enough to spend four months digging through the PEN (Poets Essayists and Novelists Club) archive at the Harry Ransom Center. Unidentified photographer. 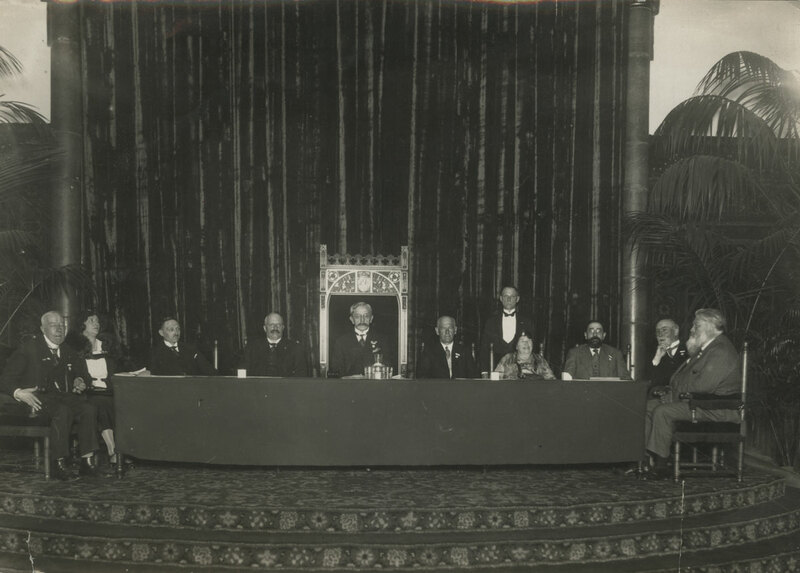 Photograph taken at the PEN Congress in Holland, 1931; seated to the right of the podium are PEN president John Galsworthy and PEN founder Amy Catherine Dawson-Scott. 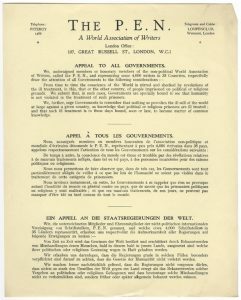 PEN was founded by the playwright Catharine Amy Dawson Scott in London in 1921 to help build international links between writers following World War One. It was more successful than she could ever have dreamed and it now encompasses 149 branches across more than 100 countries. As well as providing useful networks for writers across the world, PEN works with organizations such as the United Nations and Amnesty International to campaign for writers’ rights and against censorship. It was thanks to both an Andrew W. Mellon Foundation Research Fellowship from the Harry Ransom Center and my work on a project on free expression funded by the UK’s Arts and Humanities Research Council that I was able to dedicate so much time to working through this fascinating archive. Combining both of these projects meant that I was working through the archives of English PEN and PEN International almost from beginning to end, covering everything from the interwar years to the 1990s. The archive is vast. Its breathtaking scope covers everything from meeting minutes to financial records for almost a century. In fact, there were plenty of bemused faces when I told various Ransom Center staff what I proposed to do and rather a lot of incredulity from colleagues and friends across the world. The Ransom Center received the PEN archives in five sizable chunks over the last three decades. And this using four methods of cataloging and recording each accession, depending on who was in charge of such things at the time. Given this landscape, the collection can be somewhat complicated to navigate. Once I had adapted to one system—be it card index, vertical files, electronic files, finding aids of every kind—access methods needed to change as I moved into the next part of the archive. So I had to keep resetting myself and my search expectations! This was certainly an adventure and the main attraction of the archive in its current state is definitely the sense of unearthing items which may have been overlooked, or puzzling out how to extract certain types of information from within this enormous amount of material. I could not have done this work without the help and support of staff, who were always happy to dive back in when the box in question did not contain what we thought it did! I should mention that all of these research challenges are soon to be a thing of the past. With support from a National Endowment for the Humanities grant, the entire archive is being cataloged, and selected documents will eventually become available online. The material held in all areas of the PEN archive is incredibly rich. It is no overestimation to say that the entirety of the collection provides a unique vantage point from which to view the twentieth century. Through the eyes of influential writers such as Arthur Miller and H. G. Wells, and lesser-known names such as Storm Jameson, PEN– and the Center’s many closely-related collections of individual authors – collectively provide accounts of the Cold War, the invention and use of nuclear bombs, the rise and fall of fascism in Europe, the collapse of imperialism and founding of new states and nations, the fall of the Berlin wall, and the Balkan wars of the 1990s. 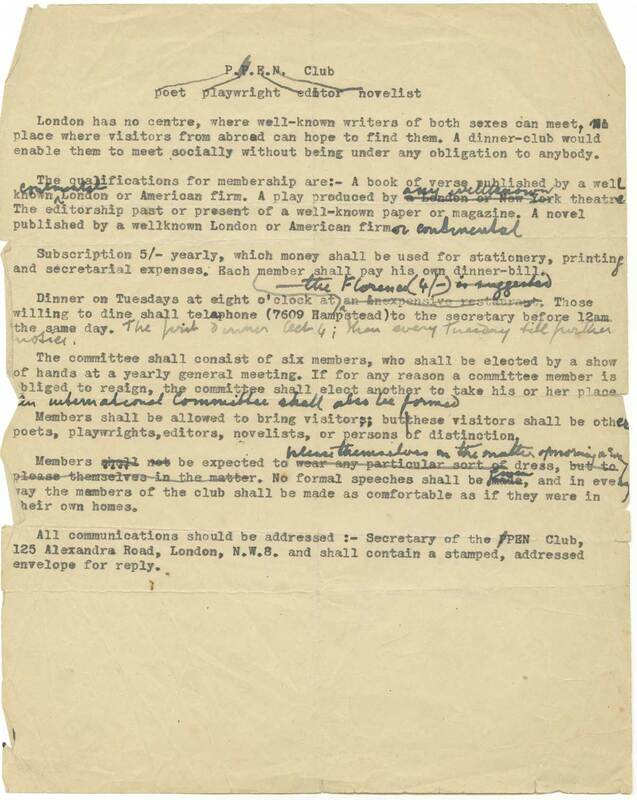 Rules drafted from the first meeting of P.E.N. PEN holdings include figures such as Nigerian writer and activist Chinua Achebe, John Steinbeck, Nadine Gordimer, Margaret Atwood, and Salman Rushdie, placing PEN at the center of many key international discussions not only around writing but around colonialism, apartheid, racial politics, gender politics, and censorship. Working chronologically, with PEN’s annual International Executive minutes providing a touchstone from which to cast off into other parts of the archive, I tracked the evolution of different ideas and discussions as they moved through PEN’s consciousness. What to do about the postwar paper shortages? How to continue to defend writers’ rights without infringing on PEN’s commitment to be non-political? How to incorporate refugees and those displaced by war into national centers or centers in exile? 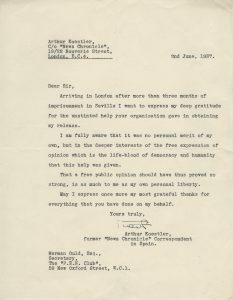 It was fascinating to see the evolution of PEN’s response to displacement, from the practical and small-scale assistance offered in the 1930s to the wider support offered during the wartime period. PEN members raised money to help refugees pay for crucial items such as typewriter ribbon and paper, introduced them to publishers, and gave them advice on continuing to write while away from home. Arthur Koestler. 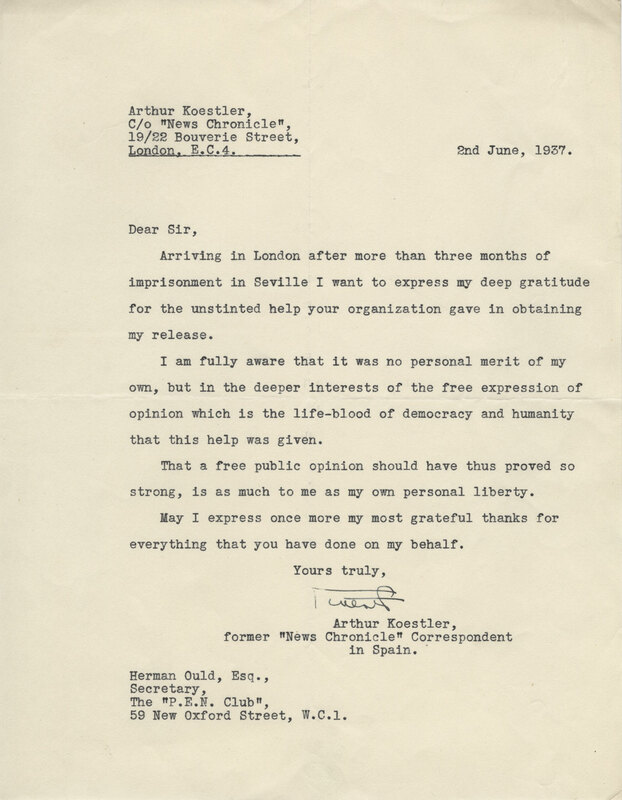 Letter to PEN secretary Hermon Ould expressing gratitude for help in obtaining his release from prison in Spain, June 2, 1937. 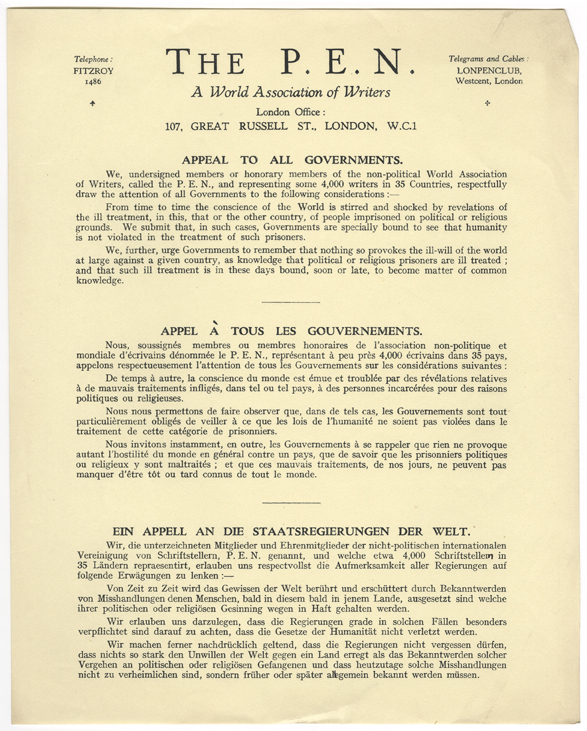 This largely undocumented activism paved the way for the creation of the Writers in Exile Centre in 1951 and for countless Centres in exile supporting displaced writers across the world. In fact, PEN International continues to work with and on behalf of displaced writers, launching this year the Make Space campaign, which helps to promote and support work in exile. This is just one strand of the discussions taking place; one chronology of issues running through a committee fraught with internal tensions over political viewpoints and even creative differences, all of which reflect something of the rapidly changing world around them. 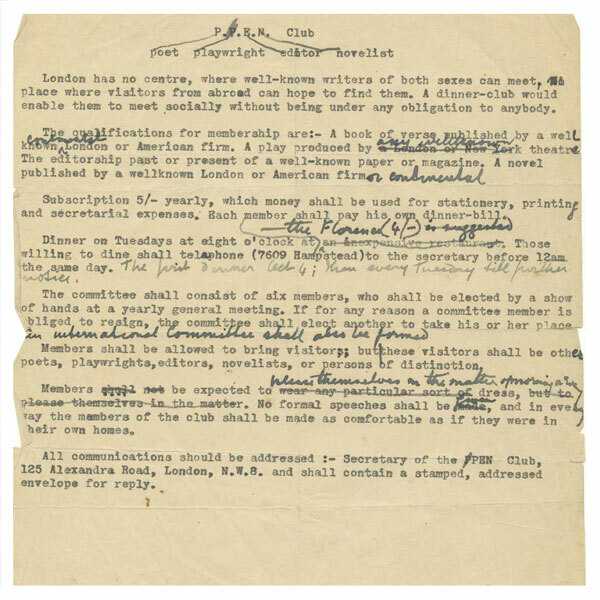 Just as the Ransom Center’s English PEN and PEN International archive is becoming more accessible, researchers are beginning to work on different areas of the organization’s history held in smaller archives and also basements, cupboards, and attics all over the world. Increased work on PEN is illuminating the key role this organization has played in the lives of individual writers and the fortunes of individual nations. —Editor’s Note: While cataloging is underway, portions of the PEN holdings will not be accessible to researchers. The PEN processing archivist, along with library public services staff, will be available to consult with researchers about possible access to PEN materials not being actively processed. The collection will be fully opened to research once the NEH project is complete, on September 1, 2019. Katherine Cooper is Senior Research Associate at the School of Literature, Drama and Creative Writing, University of East Anglia. Her fellowship at the Ransom Center was supported by an Andrew W. Mellon Foundation Research Fellowship Endowment.